After Christmas, our Christmas tree was stripped down and made into a cross and used in worship on Sundays during Lent. 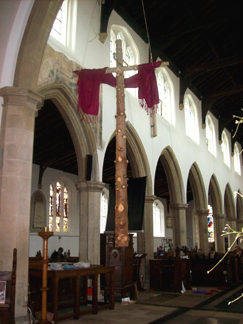 Throughout Holy Week the cross was stood outside the church. 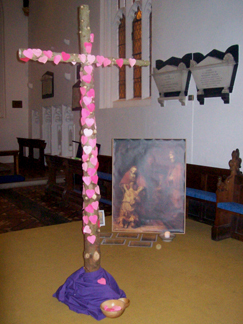 In the picture it is covered in prayers written on pink heart-shaped post-its. On Good Friday it was carried in a procession through the neighbourhood, and then brought into church to be clad in purple and crowned with thorns. During the service children hammered nails into the cross, and it was then raised up on a pulley to hang in the chancel arch. 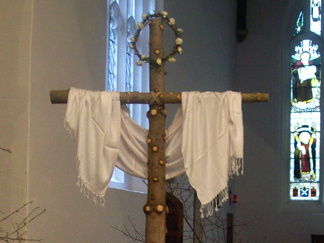 On Easter day it was draped in white and garlanded with flowers, and during Eastertide it stood in the Easter garden. 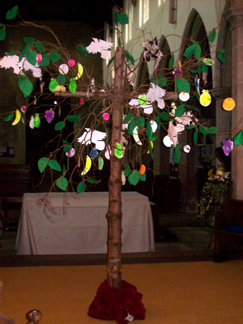 In September it became a Tree of Life for a sermon series on creation and we then used it for Harvest and All Saints. 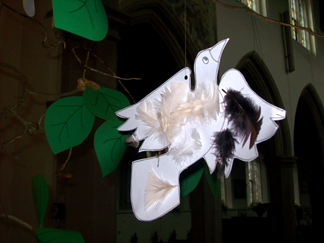 The church toddler group made fruits and birds to decorate the tree. We thought afterwards that it could also have become a Jesse tree during Advent.